Motherless, eleven-year-old Elvira, looks for a mother and finds instead the father she hardly knew she had. 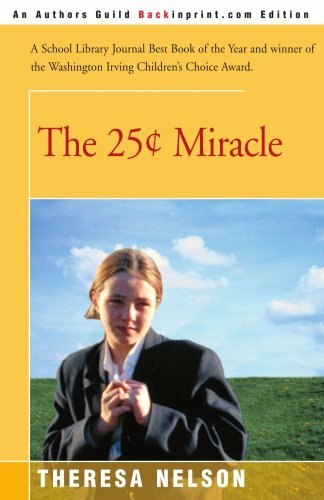 Theresa Nelson grew up in Beaumont, Texas, a town much like Calder in The 25¢ Miracle. She has written five other award-winning novels for young people: Devil Storm, And One for All, The Beggars' Ride, Earthshine, and The Empress of Elsewhere. Nelson lives with her husband Kevin Cooney in Sherman Oaks, California. They have three grown sons. Neglected 11-year-old Elvira Trumbull tries to arranges a match between her father and the town's children's librarian, whom the girl idolizes. PW praised this noteworthy debut for its sympathetic writing and perceptively drawn characters. Ages 9-12.